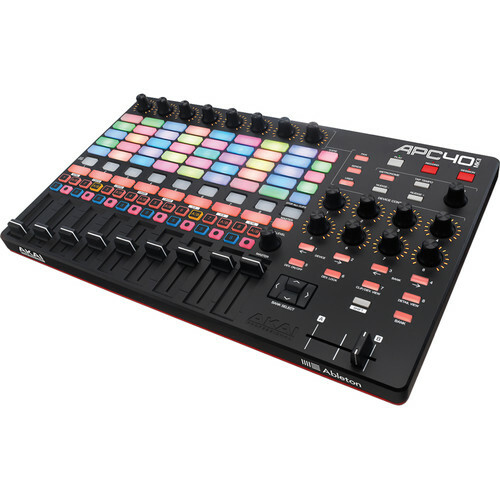 The APC40 mkII from Akai Professional is a hardware controller designed to work with Ableton Live software in a one-to-one integration, and makes significant improvements over the previous version. A few of those include an RGB clip-launching grid, reinforced fader design, revised knob lay out, and more. The controller comes pre-mapped to Live for an instant performance and production setup. The 5 x 8 RGB clip-launching grid is designed to launch clips and create or perform songs from the ground up using the forty responsive triggers. RGB lighting provides visual feedback and displays three clip statuses—loaded, playing, and recording. Clips can also be color-coded with the RGB lighting for better visual organization. Nine assignable reinforced faders and eight assignable channel control knobs are arranged in-line with each channel for an intuitive layout and smarter workflow. The eight Device Control knobs make it easy to tweak device parameters and also light up to provide visual feedback from each parameter. In addition, the Sends button enables users to cycle through all eight send buses right from the controller. The A/B crossfader has also been reworked and can be assigned and re-assigned without having to touch the mouse. All of controls can be re-assigned on the fly for customized setups that change with a performance or production style. USB power with plug-and-play connectivity allows for taking the unit from the studio to the stage or wherever. A software music production suite includes Ableton Live, two virtual synthesizers—Hybrid 3 by AIR Music Tech and SONiVOX's Wobble, along with 5 GB of samples and loops for immediate out-of-the-box music creation. The Puremagnetik Effect Racks features over two hundred audio effects, while five Toolroom artist launch packs and five Prime Loops sample packs feature a mix of electronic music. Box Dimensions (LxWxH) 20.0 x 12.5 x 3.5"
APC40 mkII Ableton Live Performance Controller is rated 4.8 out of 5 by 4. Rated 5 out of 5 by Robert from Magnificent Product Akai has kept in their tradition of producing great useful products with this addition to their line of already great products. This APC40 mkll is worth every penny. The technology in this unit surpasses any other brand. It's well built and all the functions are useful for all areas of music production. Rated 4 out of 5 by Fong from Excellent Control Surface for Ableton Live The APC 40 is an excellent control surface if you work a lot in Ableton Live Session view. The device was detected and worked immediately as soon as it was plugged in. It has sped up my workflow considerably within Ableton. The device itself is well-constructed -- could possibly be a bit sturdier. It is made of plastic. All of the controls work well. I did notice that the cross-fader control has a looser feel than the rest of the faders. I am not sure if this was intentional design or not, but it is noticable. It works fine, but I wish it had the same feel as the vertical faders do. Be careful before you install the bundled or demo software. The Akai software is fine, but the other bundled software does not compare well to many better comparable products out there and several require the additional installation of pace anti-piracy software. Just research what you are downloading and installing. This is an area Akai could do better at. They need to partner with better organizations if they are going to continue this practice. Overall, a good control surface if you work in Ableton Live Session view.